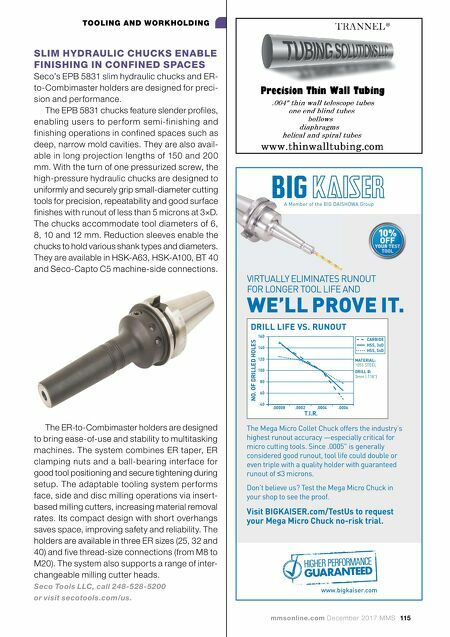 mmsonline.com December 2017 MMS 115 TOOLING AND WORKHOLDING SLIM HYDRAULIC CHUCKS ENABLE FINISHING IN CONFINED SPACES Seco's EPB 5831 slim hydraulic chucks and ER- to-Combimaster holders are designed for preci- sion and performance. The EPB 5831 chucks feature slender profiles, enabling users to per form semi-finishing and finishing operations in confined spaces such as deep, narrow mold cavities. They are also avail- able in long projection lengths of 150 and 200 mm. With the turn of one pressurized screw, the high-pressure hydraulic chucks are designed to uniformly and securely grip small-diameter cutting tools for precision, repeatability and good surface finishes with runout of less than 5 microns at 3×D. The chucks accommodate tool diameters of 6, 8, 10 and 12 mm. Reduction sleeves enable the chucks to hold various shank types and diameters. They are available in HSK-A63, HSK-A100, BT 40 and Seco-Capto C5 machine-side connections. A Member of the BIG DAISHOWA Group The Mega Micro Collet Chuck offers the industry's highest runout accuracy —especially critical for micro cutting tools. Since .0005" is generally considered good runout, tool life could double or even triple with a quality holder with guaranteed runout of ≤3 microns. Don't believe us? Test the Mega Micro Chuck in your shop to see the proof. VIRTUALLY ELIMINATES RUNOUT FOR LONGER TOOL LIFE AND WE'LL PROVE IT. Visit BIGKAISER.com/TestUs to request your Mega Micro Chuck no-risk trial. www.bigkaiser.com .00008 .0002 .0004 .0006 160 140 120 100 80 60 40 DRILL LIFE VS. RUNOUT T.I.R. NO. OF DRILLED HOLES MATERIAL: 1055 STEEL DRILL Ø: 3mm (.118") CARBIDE HSS, 3xD HSS, 5xD The ER-to-Combimaster holders are designed to bring ease-of-use and stability to multitasking machines. The system combines ER taper, ER clamping nuts and a ball-bearing interface for good tool positioning and secure tightening during setup. 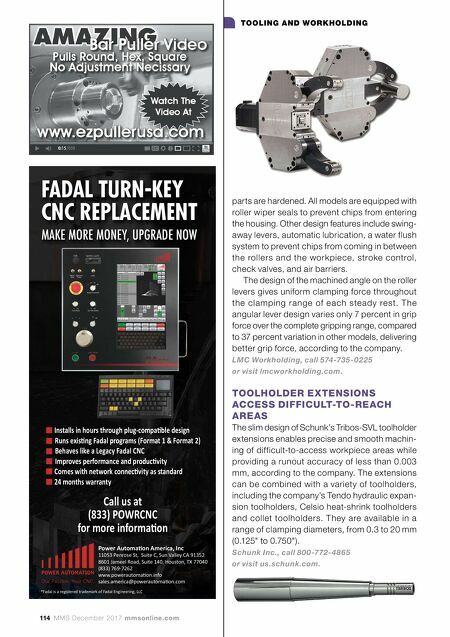 The adaptable tooling system performs face, side and disc milling operations via insert- based milling cutters, increasing material removal rates. Its compact design with short overhangs saves space, improving safety and reliability. The holders are available in three ER sizes (25, 32 and 40) and five thread-size connections (from M8 to M20). The system also supports a range of inter- changeable milling cutter heads. Seco Tools LLC, call 248-528-5200 or visit secotools.com/us.